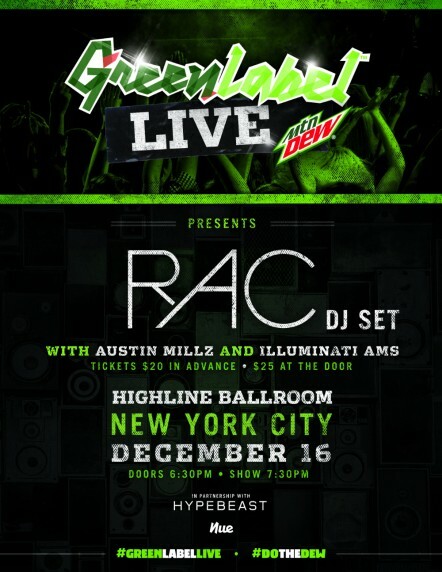 We’re bringing the sounds of Green Label to a live audience, and you guys are more than welcome to be a part of the experience! To celebrate the “Green Label Sound: Open Call” competition, we’re throwing the first in a series of concerts that you’ll definitely not want to miss. “Green Label Live” will be the ultimate stage for a few can’t-miss DJ sets by Harlem-bred mixmaster Austin Millz, Illuminati AMS and none other than our acclaimed Green Label Sound alumni, RAC. Purchase tickets right now by clicking here, but check back in coming weeks to see how you can actually win some free tickets.